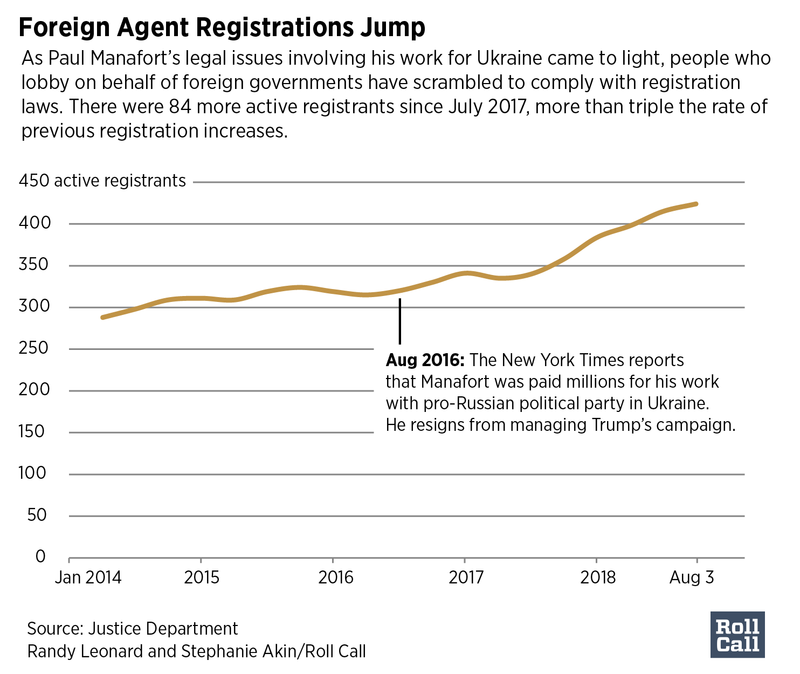 Dozens of lobbyists, law firms, and consultants have declared their work as foreign agents to the U.S. government since the news first broke in 2016 that investigators were probing the millions of undisclosed payments Manafort had received from the Ukrainian government. The Foreign Agents Registration Act, or FARA, states that every person working on behalf of a foreign entity must register with the Justice Department. The increase of more than 80 active registrants in the last year is more than triple the rate of previous increases in active registrations. Manafort faces charges that include money laundering and failure to register as a foreign agent, as required under an oft-ignored law. The case prompted speculation that other Washington lobbyists would review their compliance with foreign lobbying rules. Lawmakers from both parties have meanwhile called for FARA to be overhauled and outside groups have called for improvements in the way the information is collected and stored. FARA was passed in 1938 over concerns about Nazi propaganda agents operating in the United States before World War II. Until Manafort’s 2017 indictment, it was rarely enforced.